Fairly early on, Mississippi Grind makes reference to Huckleberry Finn. There are parallels. 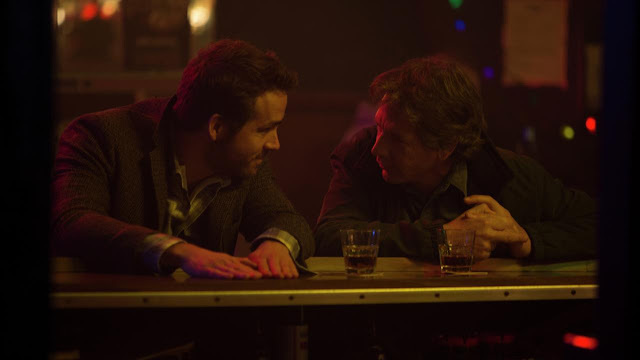 Gerry (Ben Mendelsohn) and Curtis (Ryan Reynolds) are floating down a metaphorical (sometimes literal) river, travelling towards an uncertain destination, enjoying unseen parts of America along the way. This is a very different America to Huck's though, and whilst writer/directors Anna Boden and Ryan Fleck don't quite settle on what their version and vision of America is, the suggestion of it and willingness to let the audience decide is occasionally delicious. Even more delicious are the deliberate touch points the film raises with another American classic: It's A Wonderful Life. During a very brief period, there's a suggestion made by the directors that Curtis is merely a figment of Gerry's imagination. We see Gerry talking to him in a motel mirror, whilst Curtis' reflection sits there impassive, unmoving; absent. It's no coincidence that the two characters first initials are shared by James Stewart's George Bailey and Henry Travers' Clarence. Once you settle on that idea, the film's notions of Huck-esque American examination and It's A Wonderful Life redemption give the narrative new meaning. Gerry, a deadbeat gambler who doesn't quite know that's what he is, partners with Curtis to travel to a high stakes poker game. Curtis is bank-rolling the endeavour, whilst Gerry merely aims to get back on his feet. The picture emerges of a man (and possibly a nation) which doesn't entirely deserve or arguably want the redemption on offer to him. The final scenes suggest that Gerry and Curtis are, in some ways, bent on their own self-destruction; living the nomadic noncommittal life they both seem to lead by virtue of dire choice, rather than unlucky chance. Is Gerry beyond redemption? Not at all, but at every turn where there is an offer for him to do so, he seems to choose a different path. The ramifications for where his nation finds itself are interesting to consider. Even if you don't draw the same parallels, Boden and Fleck are experts at drawing the Gerry type of character; broken but unknowingly so. Fleck's earlier film, Half Nelson, co-written and edited by Boden features a similar portrayal. Whilst the film excels at painting Gerry and drawing parallels from him, it is less successful in the handling of the Curtis character. With passing similarities to some of Reynolds' earlier frat boy outings, Curtis gets less interesting the more we find out about him. His on/off relationship with Simone (Sienna Miller) has no impact on anything which happens in the plot and the notion that he might not be there is only played on passingly (surely his interactions with people like Simone completely rule it out - a rather sad conclusion to an exciting suggestion). Despite his characterisation though, the film does find a lot of truth. At the very least it finds it about Gerry and his particular type of self-destructive personality. Everything feels accurate, down to the ill-fitting clothing. More excitingly though, Mississippi Grind feels as though it finds truth about the nation it presents in static imagery before every segment of the film. It has jagged edges, but then so does that very nation Boden and Fleck seem to be holding a mirror up to.